For the past 20 years I have had a secret crush. His name is David Austin. He lives in England. He grows roses. Actually, he creates roses. He even created a new kind of rose … English roses … blending Old Garden Roses for form and fragrance with modern roses for repeat blooming and increased range of color. To me that is the perfect combination! Who wouldn’t be smitten! My favorite one (for the moment) is Charlotte or is it Gertrude Jekyll … or it could be Mary Rose or Crocus Rose on any given day. All are beautiful, charming and sooooo fragrant. 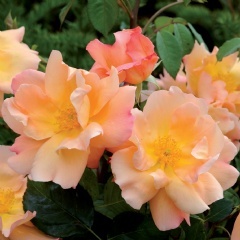 Recently I had the pleasure of speaking with Michael Marriott of David Austin Roses on Rose Chat Radio who talked about the new releases for 2013. Listen here. 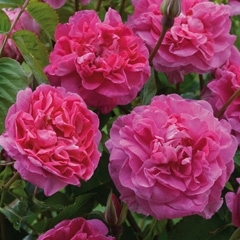 Wollerton Old Hall is the most fragrant new variety and, indeed, one of the most fragrant of all English Roses. Its distinctive strong myrrh scent has a delicious citrus element. Plump buds, with attractive flashes of red, open to form beautiful chalice-shaped blooms of soft apricot, eventually paling to cream. It forms a particularly healthy and bushy shrub with few thorns. 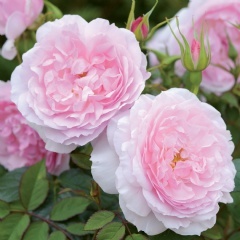 Lady Salisbury exhibits great Old Rose charm, with some of the character of the Alba Roses. 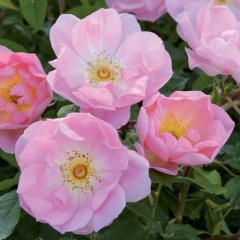 Rich rose pink buds open to reveal pure pink flowers, which gradually become a softer shade as the flowers age. There is a light fragrance. ‘Lady Salisbury’ flowers with remarkable continuity from early summer on. Fighting Temeraire is a very different English Rose. The fully open flowers are very large at 4” to 5″ across, each with only 12 petals. The flowers are a rich apricot color with an area of yellow behind the stamens which later pales to a soft yellow-apricot. England’s Rose is a particularly tough and reliable variety. Deep glowing pink flowers are held in large clusters, the outer petals eventually reflexing back to reveal an attractive button eye. 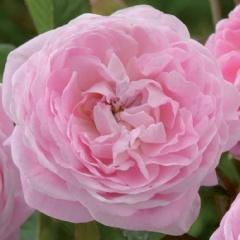 The Lady’s Blush is a charming semi-double variety with delicate natural beauty. The flowers start as elegant pointed buds and develop into rounded cups in pure soft pink with a creamy white eye and often a white stripe. 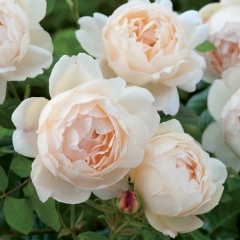 Queen Anne is a rose of classic Old Rose beauty, but rather more in the direction of the Centifolias or Bourbons. The medium-sized flowers are pure rose pink, the outer petals only slightly paler than the central ones. In habit, ‘Queen Anne’ is quite upright and bushy, with few thorns. Visiting this amazing garden is definitely on my “bucket list”. And, here’s the man himself…. Thank you Mr. Austin for such beautiful additions to our gardens! Follow David Austin Roses on Twitter @DavidAustinHome. The photos of the blooms are very beautiful! Queen Anne touches my heart. Toooo funny. I AM very excited about these new roses! Oh man, now I’m in full blown “rose lust”. Each one you pictured elicits a different desire so having to pick just a handful for my new rose garden is going to be difficult. David Austin’s roses always make me very wanty. This is an excellent post! I love roses, always nice to see which roses other gardeners like. It’s simply a delight looking at your beautiful garden. It’s food for the soul. Thank you! Christa, Thanks so much for your kind words. It is my pleasure! So glad you stopped by!